The body of information about global, national, and regional climate change is growing by the day. In 2002, the Washington State Legislature authorized the WSU Energy Program to establish the Climate and Rural Energy Development Center. This webpage provides information about relevant state, regional, and national activities and resources. The WSU Energy Program provides technical expertise to the Washington State Department of Revenue in certifying solar photovoltaic (PV) energy systems that qualify for incentives. For more details, see "Energy Production Using Solar, Methane, & Wind Power" (select + on the Department of Revenue webpage to expand information about this cost recovery program, including forms to submit to the Department of Revenue). We are involved in many other projects to help reduce our reliance on fossil fuels, which produce greenhouse gas emissions. Relevant projects are described on these webpages: Building Efficiency, Industrial Efficiency, Agricultural Efficiency, Renewable Energy (including alternative fuels, hydrogen and fuel cells, and solar), and Public Facilities Support. We also provide Washington State Energy Code support for new residential construction. New construction standards are expected to cut residential natural gas consumption significantly, reducing carbon dioxide emissions. EnergyAg Newsbriefs is a free, monthly news service that highlights agricultural news, events, and resources relevant to rural energy development. Agriculture Matters is a searchable database that links to energy information for the Northwest agricultural community and a collection of energy factsheets. Rural areas play an important role in the development of renewable energy resources. A growing number of rural landowners are leasing their land for wind farms. Farmers grow crops such as corn and soybeans to produce ethanol and other alternative fuels. WSU is involved in supporting these efforts. Climate Friendly Farming is a five-year research and demonstration project managed by the WSU Center for Sustaining Agriculture & Natural Resources. The project focuses on dairy farming, irrigated crop farming, and dryland grain farming. Researchers are assessing the impact of these three types of farming on global warming, and developing and analyzing strategies for mitigation. Washington State Department of Ecology tracks greenhouse gas emissions in the state and provides information on how climate change may affect Washington. Local clean air agencies protect air quality in most areas of Washington. Climate Impacts Group focuses on climate science research and its public policy implications for the Pacific Northwest. Affiliated with the National Oceanic and Atmospheric Administration and the University of Washington, the group examines climate impacts on water, forests, salmon, and coasts. Climate Solutions is dedicated to developing practical solutions to global warming in the Pacific Northwest. Harvesting Clean Energy is a program of Climate Solutions to help accelerate rural economic development in the Northwest through clean energy development. Puget Sound Clean Air Agency is a four-county air pollution control authority that has initiated a process for bringing stakeholders together to develop regional climate protection strategies. The Intergovernmental Panel on Climate Change is an international organization established by the World Meteorological Organization and the United Nations Environment Programme to evaluate scientific, technical, and socio-economic information related to climate change. This website offers free, in-depth reports. 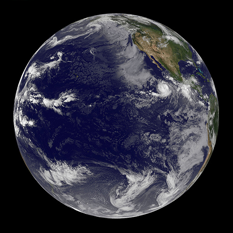 The Goddard Institute for Space Studies, part of the National Aeronautics and Space Administration, focuses on atmospheric modeling and a broad, interdisciplinary study of global climate change. One of the institute's main goals is to predict atmospheric and climate changes in this century. The National Academies: Global Warming/Climate Change Collection provides links to publications from the National Academies about the science and policy implications of global warming and climate change. The U.S. Energy and Information Agency: Greenhouse Gases, Climate Change, and Energy brochure offers an overview of the problem, including graphs and charts. U.S. Environmental Protection Agency: Climate Change website outlines the problem, quantifies greenhouse gas emissions, looks at impacts, and describes what is being done to mitigate climate change. The U.S. Global Change Research Program, started in 1989 as a presidential initiative and codified in the Global Change Research Act of 1990, supports research on climate and global change. Natural gases such as water vapor and carbon dioxide form a shield around the earth that captures some of the sun's energy, which otherwise would radiate back out to space. Without this "greenhouse effect," Earth's temperatures would be inhospitably cold. Human activity in the last century, however, has concentrated this blanket of gases, trapping additional heat. The earth's surface temperature is now about one degree Fahrenheit warmer than it was 100 years ago, according the National Academy of Sciences. Researchers believe the burning of fossil fuel - used to run cars and trucks, generate electricity, heat buildings and power factories - is primarily responsible for the buildup of three important greenhouse gases: carbon dioxide, methane, and nitrous oxide. Fossil fuel-burning activities account for 98 percent of U.S. carbon dioxide emissions, 24 percent of methane emissions, and 18 percent of nitrous oxide emissions, according to the U.S. Environmental Protection Agency. Agriculture, deforestation, landfills, industrial production, and mining also contribute to the problem. Unless emissions are reduced, scientists predict the earth's atmosphere will continue to warm, resulting in flooding in some areas and drought in others.